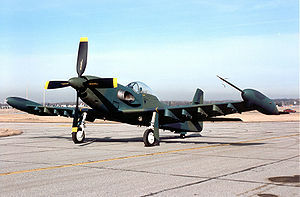 The Piper PA-48 Enforcer is a turboprop powered light close air support/ground-attack aircraft built by Piper Aircraft Corp. Lakeland, Florida. It was the ultimate development of the original World War II North American P-51 Mustang. The Enforcer concept was originally created and flown by David Lindsay, owner of Cavalier Aircraft, in response to the United States Air Force PAVE COIN program, but Cavalier did not have the political clout or manufacturing abilities to mass-produce the Enforcer, so the program was sold to Piper by Lindsay in 1970. 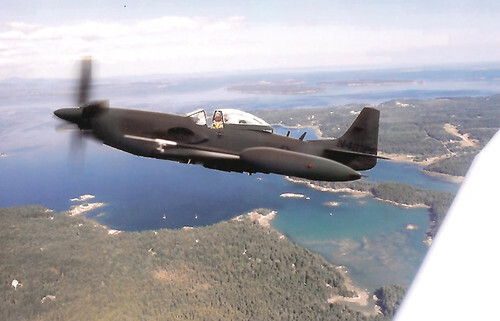 In 1971, Piper built two Enforcers by heavily modifying two existing Mustang airframes, fitting them with Lycoming YT55-L-9A turboprop engines along with numerous other significant modifications. One airframe was a single seat (called the PE-1 and FAA registered as N201PE), the other a dual-control aircraft (the PE-2, registered N202PE). Prior to the Pave COIN evaluation, N202PE was lost in a crash off the Florida Coast due to flutter caused by a Piper-modified elevator trim tab. Although the Enforcer performed well in Pave COIN test flown by USAF pilots, Piper failed to secure an Air Force contract. By the time the PA-48s were completed, they shared less than 10 percent of their structure with the P-51, and were longer and larger. Essentially, the PA-48 Enforcer was a completely new aircraft. The two PA-48s were tested during 1983 and 1984 at Eglin AFB, Florida and Edwards AFB, California. As in the Pave COIN tests of 1971, the PA-48s were found to perform well in their intended role, but the USAF again decided not to purchase any. Of the prototype aircraft produced, two of the four still exist. One of the PA-48s (N482PE) awaits restoration at Edwards Air Force Base. N481PE (pictured above) has been fully restored and resides in the "Prototype Hangar" at the National Museum of the United States Air Force at Wright-Patterson Air Force Base near Dayton, Ohio. O'Leary, Michael. "Enforcer." Mustangs: North American Aviation's P-51: Past, Present & Future, Warbirds International, Summer 2007.